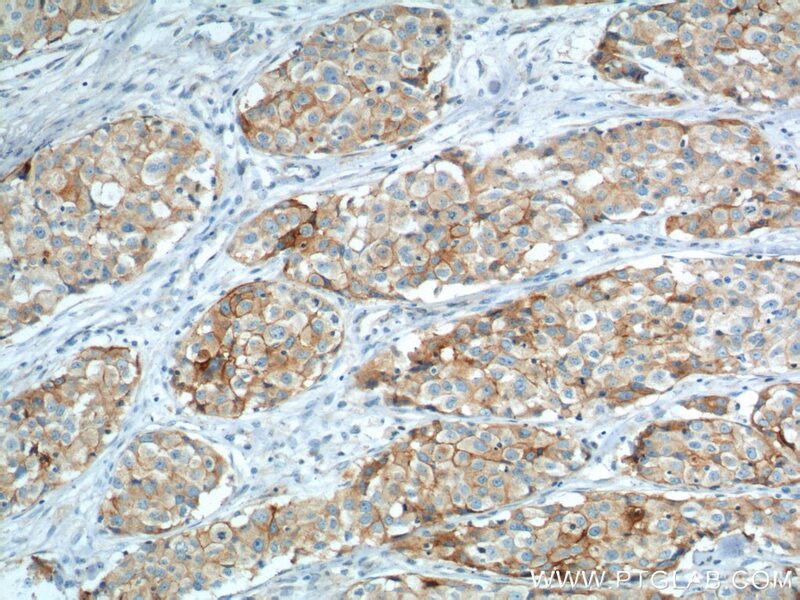 Immunohistochemical analysis of paraffin-embedded human lung cancer tissue slide using 66294-1-Ig (VCAM-1 antibody) at dilution of 1:600 (under 10x lens) heat mediated antigen retrieved with Tris-EDTA buffer(pH9). 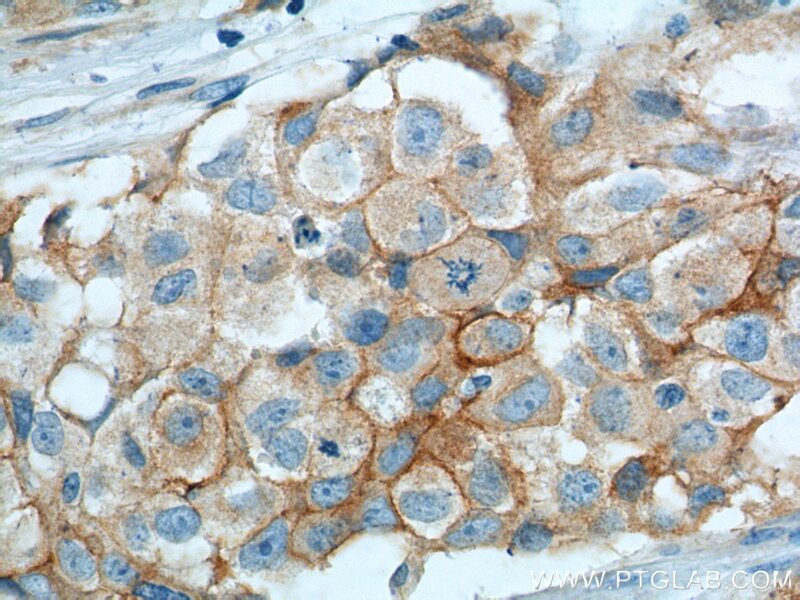 Immunohistochemical analysis of paraffin-embedded human lung cancer tissue slide using 66294-1-Ig (VCAM-1 antibody) at dilution of 1:600 (under 40x lens) heat mediated antigen retrieved with Tris-EDTA buffer(pH9). Vascular cell adhesion molecule 1 (VCAM1), also known as CD106, is a 110-kDa transmembrane glycoprotein belonging to the immunoglobulin gene superfamily. VCAM1 is expressed by cytokine-activated endothelium, interacts with integrin VLA4 (α4β1) present on the surface of leukocytes, and mediates both adhesion and signal transduction. It is also expressed either constitutively or inducibly in a variety of other cell types, including vascular smooth muscle cells, differentiating skeletal muscle cells, renal and neural epithelial cells, macrophages (Kupffer cells), dendritic cells, and bone marrow stromal cells (PMID: 7507076, 11359843). Tail vein injection of mmLDL upregulates mouse mesenteric artery ETB receptors via activation of the ERK1/2 pathway. Metformin ameliorates the progression of atherosclerosis via suppressing macrophage infiltration and inflammatory responses in rabbits. LncRNA NKILA regulates endothelium inflammation by controlling a NF-κB/KLF4 positive feedback loop. 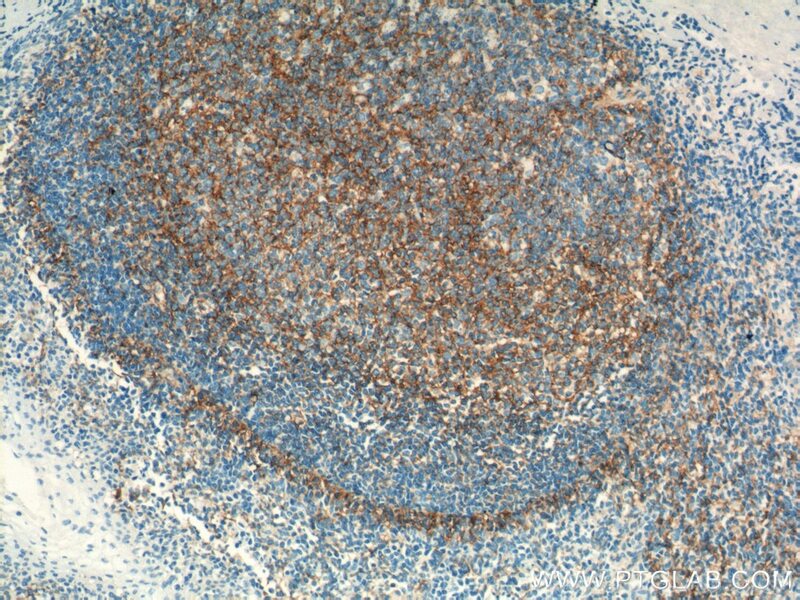 Immunohistochemical analysis of paraffin-embedded human tonsillitis tissue slide using 66294-1-Ig( VCAM-1 Antibody) at dilution of 1:200 (under 10x lens). heat mediated antigen retrieved with Tris-EDTA buffer(pH9). 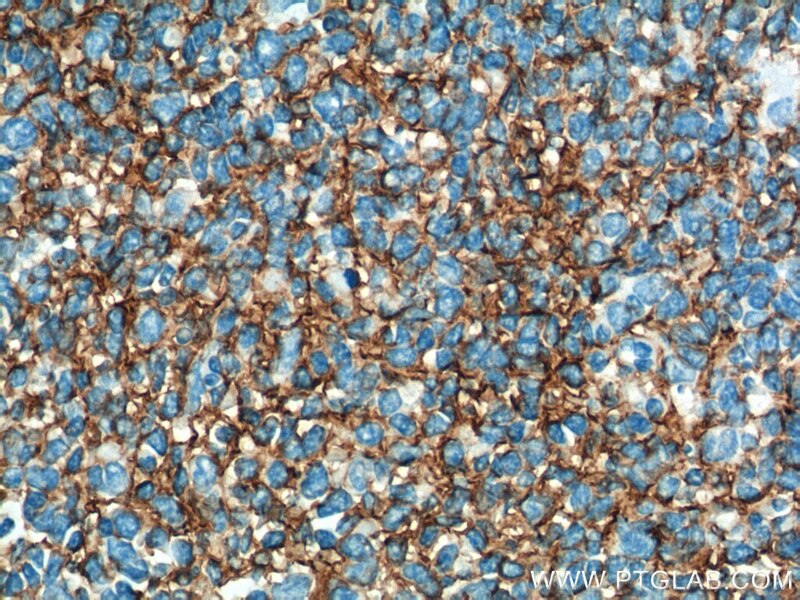 Immunohistochemical analysis of paraffin-embedded human tonsillitis tissue slide using 66294-1-Ig( VCAM-1 Antibody) at dilution of 1:200 (under 40x lens). heat mediated antigen retrieved with Tris-EDTA buffer(pH9).